It’s been a long long time since I’ve been to a good old fashioned diner. Like a long time. So when we were looking for a fun Sunday lunch with my parents, the offhanded “I could go for Art’s” comment by Friand tickled my fancy and led me straight to their website to scope out the menu. The worst thing about Art’s is their website, a throwback to be sure. Although initially a turn off, I realized that I can’t always be a website snob or I may just miss something important. A local favorite, my husband has told me countless stories of his adventures there as a teenager. His enthusiastic nostalgia had me hooked, and after a few minutes of grumbling about how I had to download a menu pdf, I bit the bullet. Scroll to the bottom of the page and you’ll see a line that says “”click below to view and download menus”. If you click that line, you’ll automatically get their “restaurant & take-out menu”, but scroll through the list below and you can download the other menus: Deli, Catering, and Kids. Scrolling quickly through the Deli menu, there’s really not much for a vegan to eat. In fact, just skip the deli menu altogether and go straight to the very large Restaurant Menu! I was thrilled to see a little note at the bottom for *vegetarian soups: Bean and Barley, Split Pea, Tomato Basil, Sweet and Sour Cabbage, Vegetarian Vegetable and Beet Borscht. If you’re going to try any of those, be sure to ask your server for a full ingredients list. In recent months, it’s come to light that many stocks actually contain butter, although perfectly acceptable for vegetarians, obviously not vegan. And it goes without saying to be on the lookout for cream and cheese. Soy Latte – they have soy milk! Just ask for it! There is plenty for our vegetarian friends in the Traditional Deli Specialties, and there is actually a “Vegetarian Sandwich”. I did not see this item, though, printed in the menu at our table. I should have asked about it at the time, but I did not. Personally, I would skip the cup of fruit and go for the fries! Of course, help yourself to any of the fries and rings on the menu! I ordered the Veggie Burger because it seemed like a burger kind of day. I have to admit that I did not ask about specific ingredients in the veggie burger. What I can tell you is that I had a mild stomach discomfort after the meal, but that could have been any number of things from cross contamination or due to the fact that I ate all the fries, too. A gourmet veggie burger it was not, but it was satisfying and fun; what else could you want from diner food! Did you say ketchup & mustard? Oh yeah. Did that, too. 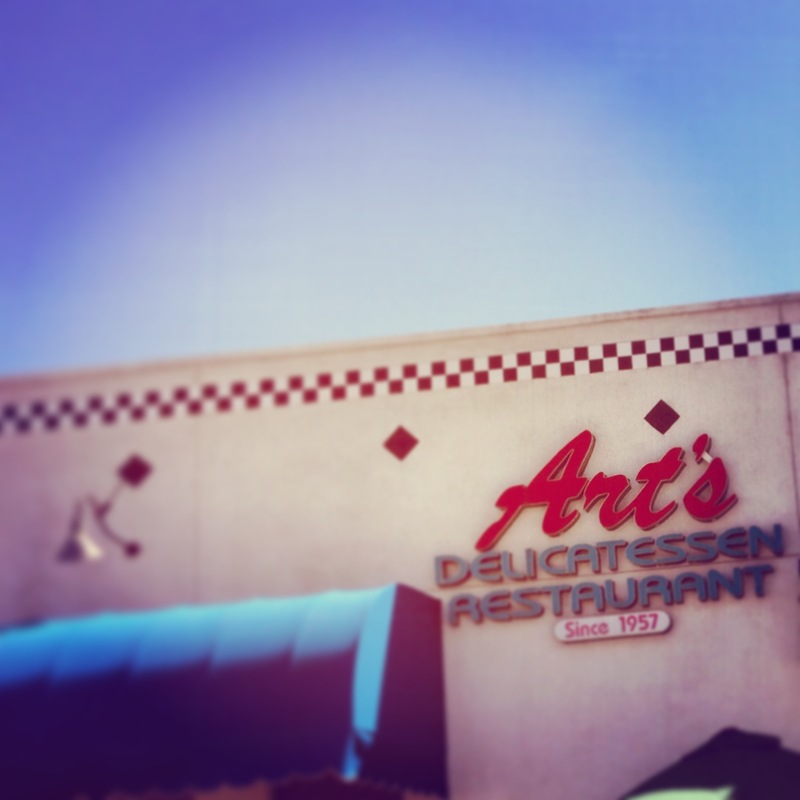 Art’s was a really fun lunch out with the whole family. Everyone was able to get exactly what they wanted, including the vegan. So pack up the clan and hit the deli! And ask for Birgitta – quite possibly the best waitress in all the San Fernando Valley! Loved her!! Art’s gets 5 sprouts for a surprisingly vegan friendly menu! Like what you read? Want more posts like this sent directly to your inbox? Scroll down to subscribe to the blog, and don’t forget to follow me on Facebook and Twitter!